Makiginu means a roll of silk fabric wrapped around a core. High quality ones were offered as gifts to deities and nobles. 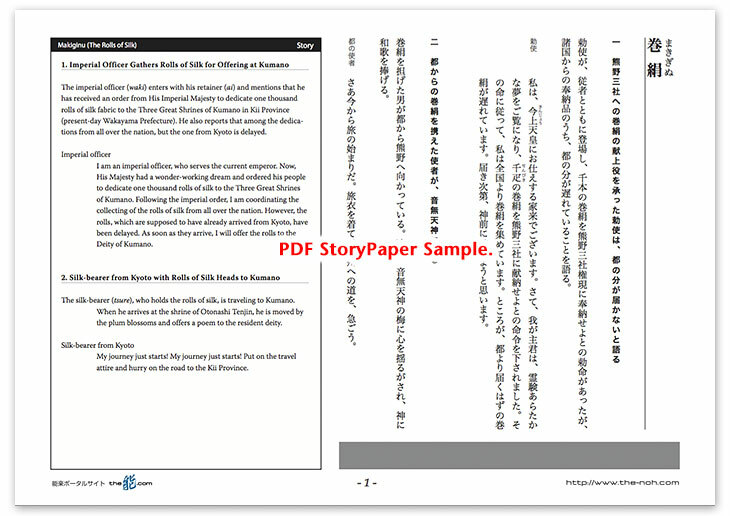 The emperor has a miraculous dream and orders one thousand rolls of silk to offer to the Three Great Shrines of Kumano in Kii Province (present-day Wakayama Prefecture). An imperial officer is put in charge of receiving the rolls of silk from all over the nation in Kumano, but soon feels frustrated with the silk-bearer from Kyoto who has not yet arrived. Meanwhile, the silk-bearer from Kyoto stops by the Shrine of the Deity Otonashi Tenjin to pray, on his way to the Kumano Hongū Shrine. He offers a poem because he is attracted by the scent of plum blossoms in the precincts of the Otonashi Tenjin Shrine. 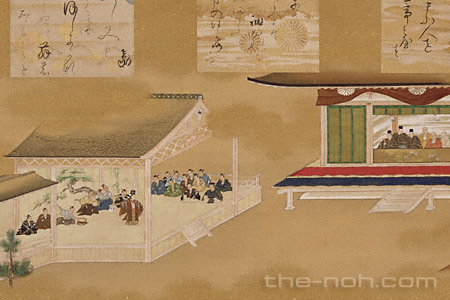 Although the silk-bearer from Kyoto finally arrives at Kumano Hongū Shrine, he is charged for his delay and bound with rope by the imperial officer. Then, a Shinto priestess, who is possessed by the Deity Otonashi Tenjin, appears and orders the imperial officer to release the silk-bearer, because the poem offered by the man eased the deity’s suffering. At first, the imperial officer doubts the priestess’s words because he believes that such an ignoble man like the silk-bearer would be unable to read a poem. However, the priestess proves herself by having the silk-bearer recite the first half of his poem, which she herself then correctly completes. The silk-bearer is therefore released. The priestess dances and praises the virtue of the poem. Responding to the imperial officer’s request, she offers Shinto prayers and performs a Shinto kagura dance. While dancing, she is intensely possessed by a deity. She roughly swings a sacred hei stick, jumps and soars, and throws herself to the ground. Eventually, after the priestess dances in a frenzy for some time, the deity who possessed the priestess leaves her body, and she returns to normal. Kumano Hongū Shrine, located in the mountains of Kii Province, is the stage of this drama. The mystic story, played in a precinct of the shrine that is surrounded by crisp and serene nature, relaxes and mellows the audience, and invokes a mysterious feeling, which they might feel slightly nostalgic. The silk-bearer from Kyoto puts the reading of a poem and the offering of it to a deity before the delivery of important rolls of silk to the shrine. His mind-set is blessed by the resident deity. In contrast, the imperial officer whose mind is restricted by rules is softly reproved by the deity for his tying up of the silk-bearer. He becomes aware of the value of the heart, with which it is tasteful to read a poem, rather than being chained by rules and assumptions. Since ancient time, the Japanese have believed that a poem has a mysterious power. Such recognition would exist in the background and emergence of this piece. The highlight of this piece is the set of scenes in which the priestess is gradually but fiercely possessed by a deity while lauding the virtue of a poem and dancing; the scenes shift from kuse to kagura and continue to kiri.